​We believe that the gifts we choose (for others or for our selves) add beauty to our lives and enhance the connections between us (the artisan and you and the person you are shopping for). The gifts we give are an expression - of our sentiment and of our own character. Whether you're buying food for your table to share a meal with friends or a particular piece of art that has a special meaning for someone you love, gifts and goods express feelings and weave into memories. 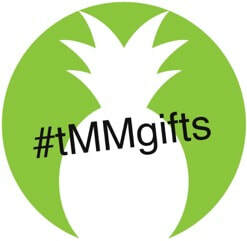 ​At #tMMgifts, we stock an eclectic assortment of wares that are conscientiously curated to ensure you don't have to spend anytime considering the sourcing (did I mention that all our gallery pieces, gifts, goods and groceries are locally made by hand or small batch and come from the best of materials and ingredients?). ​We focus on remaining rooted to our principles while connecting artisans and patrons through the store. Our goal is to encourage a positive change (for the environment, local economy, and the community) in consumerism. ​ - there are consignment (preferred) and wholesale opportunities. If you have questions about this, don't hesitate to ask - we are happy to share our story.